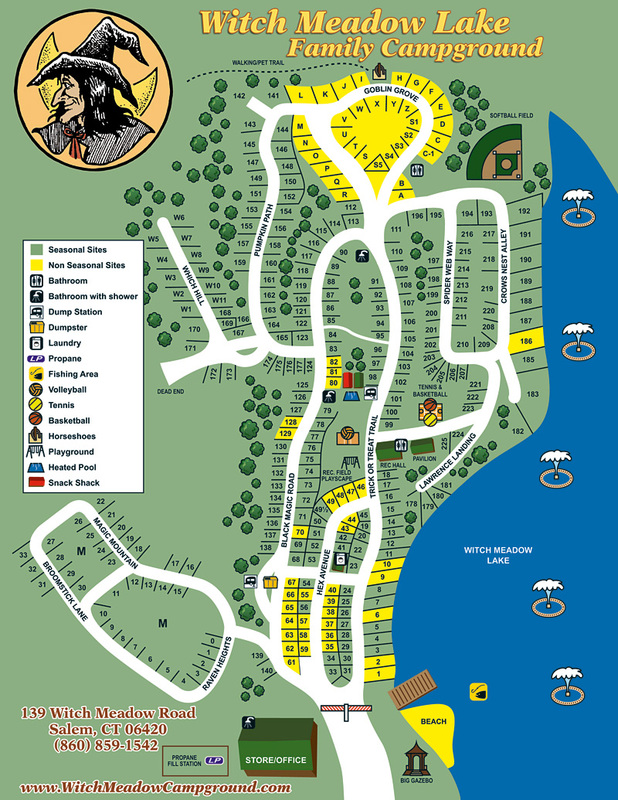 Please click on the map above for a full-size downloable map of our campground. Season: The official camp season extends from May 1 to Columbus Day. Registration: One family per site. Family consists of two adults and their unmarried children under the age of 18. Maximum of 5 in family. Additional charge for extra persons. You must be over the age of 21 to register. Non-married couples must all be over the age of 21. Fees: No reservation shall be acknowledged without deposit. Deposits are non-refundable, unless cancellation is made at least 10 days prior to arrival date. Cancellation: Refunds are given on cancellations made 10 days prior to arrival. 20% handling fee. Check-In: Check-in is after 3:00PM. There is a charge of $3.00 per hour for early check-in if site is available. Check-out is 2:00PM. There is a charge of $3.00 per hour for late check-out if site is available. Visitors: There is a campground facility fee of $8.00 per day for adults, $6.00 per day for children under the age of 12. Overnight visitors will be charged an extra $7.00. Day visitors must be out by 8:00PM. No visitors will be allowed to enter the park after 8:00PM. No more than four visitors on any one site at any time without the consent of management. The pavilion may be used or rented for large parties. No visitors may have visitors. No visitors may have pets. No overnight visitors on holidays. All guests must be registered. Minors: Anyone under the age of 21 must have a daily sponsor. You cannot leave your child here all day unless you have made arrangements with another person over the age of 21 to accept responsibility for your child. Curfew: All campers at their site are expected to be quiet and considerate from 11:00PM - 8:00AM. Teens and children must be at their site by 10:00PM Sunday - Thursday, 11:00PM Friday, 11:00PM Saturday unless the child is at a campground activity with a parent or sponsor. Alcoholic Beverages: The excessive use of alcoholic beverages will not be tolerated. The management reserves the right to terminate the tenancy of any guest for reasons the former shall deem objectionable. Underage drinking is not permitted and reason for immediate termination of stay for entire family. No alcohol in recreation hall, on beach, playscape, or basketball court. No kegs. Bicycle Riding: Only one person on a bike at one time. No riding after dark. We are not responsible for children on bikes and on other toys. Children must wear helmets. No skateboards. No Heelys in store, recreation hall or pavilion. Boating: Boats, oars, and life preservers may be rented at the store. No one is permitted to use a boat without enough life preservers on board for everyone. All boats must be signed out and rented by an adult. No outboard or electric motors. Campground Destruction: Campground destruction results in immediate termination. No refunds will be given and you will be liable for damages. No digging. If you damage property inadvertently, please notify the office immediately. Drugs: Drugs are illegal! They are not tolerated at this park. When you are caught all those in possession and anyone involved will be asked to vacate the premises. No refunds. Emergencies: Dial 911 for true emergencies. Fires: Firewood may be purchased at the store. You are not allowed to bring outside firewood. Fires are permitted in the fireplace provided at the campsite. No ground fires. Cutting of trees is prohibited. Do not move fire ring. Please extinguish your fire before leaving. Do not burn plastics, rubber or any other combustibles. Fireworks & Firearms: Fireworks/firearms are not permitted on the premises at any time, except in the possession of officers incident to the exercise of their duties, this will result in immediate termination. Grey Water: We understand that some grey water hookups fail due to soil conditions, weather, or other nonpreventable reasons, but if we have to redig a grey water and find it loaded with food or sewage you will be charged $40.00. Grey water is for water only. All grey water hookups must use 3/4 inch hose. Messages: We will deliver emergency messages ONLY. Please check the message board in front of the office for your messages. Miscellaneous: No outside refrigerators. Positively no clothes lines hanging from trees. Folding and portable lines are permitted. No canopies or tarps. No vehicle repairs done on site. No motorbikes, ATVs, golf carts, electric scooters, or unregistered vehicles. All drivers must have a valid license. Only 2 cars registered per site. No household furniture allowed on sites. Motorcycles: Loud motorcycles shall not operate or be heard at any time within the park. Pets: All pets must remain on their own site at all times. There is no walking of pets on the campground other than the pet walking trails. You are expected to pick up after your pet. All dogs and cats must have rabies shots. Bring your rabies certificate with you when you check in. Visitors may not bring pets. No Pit Bulls, Rottweilers or wolf breeds. No more than 2 pets per family on a site. Barking dogs will not be allowed to stay at the park. Propane: Propane is filled at 8:30AM, 12:00PM, and 4:00PM, in an emergency go to the store and see if a fill up is possible. Property Loss: The management is not responsible for any personal property lost or damaged on the campground by fire, theft, acts of nature, accident, etc. Security Gate: This system was designed for your benefit. Do not walk through it or hang from the arm. All campers are responsible for making their visitors understand gate use. Misuse of this system will not be tolerated. Do not give your gate card to a visitor or another camper. All visitors will be let in by staff only. Swimming: Lake swimming is permitted only in designated beach area. All lake privileges are performed at the individuals own risk. Children must have adult supervision anytime they are in the water. The dam is off limits. No swimming after dark. Do not swim alone. There is no lifeguard on duty at any time. Trash: Trash generated by camping at the park may be disposed of in the dumpsters. Please separate cans/bottles, cardboard, and trash. No bulky waste.